People use journals for all sorts of reasons, like keeping lists, creating art, or as a diary. No matter what you decide to do with your journal, it’s extra special if it’s handmade. Here are five really great handmade journals that are sure to inspire you. 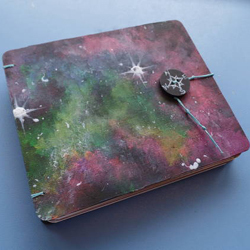 tendstowardschaos used UV-reactive acrylic paint on wood to create the covers for a beautiful set of nebula journals. Old book covers make great covers for new journals. 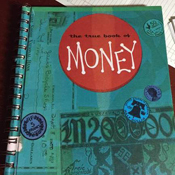 For this one, “The True Book of Money”, craftADDchick used ledger paper for the inside pages. 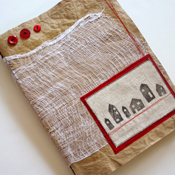 LimeRiot saved up paper grocery bags and bound them together to make this soft cover “sloppy journal“. I love the pops of red! 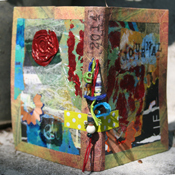 This tiny travel journal cover by cmarion3 was made by covering a cereal box with a paper bag and collaging together things like torn paper and washi tape. Here’s another cover made out of light cardboard and a paper bag. 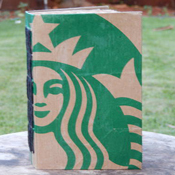 StaticMonster put the striking graphic from a Starbucks bag to good use. There are many ways to create your own journal. Click on the Craftster tag “journal” to see more. These are all so fantastic! I can’t resist a beautiful journal. They are all fantastic! I’m trying that sloppy journal limeriot posted. I think I need to be more careful though, I made papier-mâché out of the bags I soaked, oops! Oh my gosh, I’ve done the same thing! What a mess, hahaha!